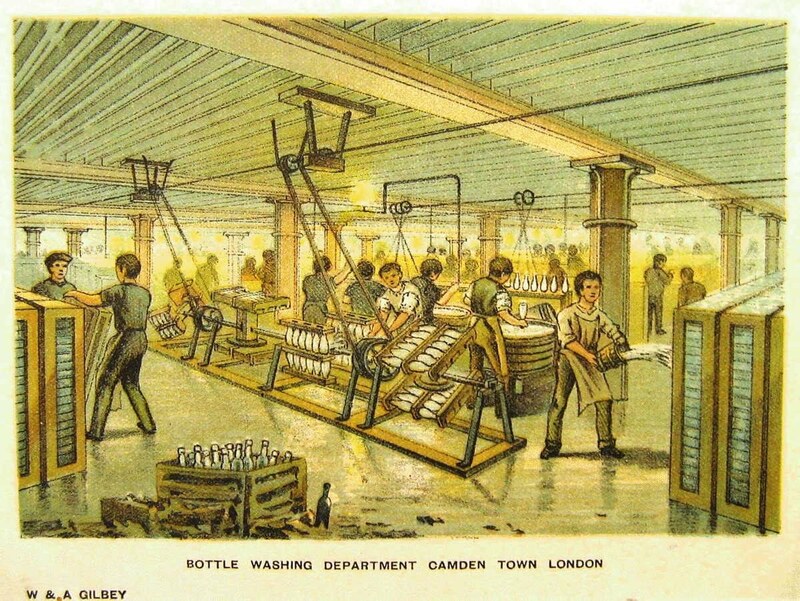 The firm of W&A Gilbey Ltd, formed in 1857 as importers of wine from South Africa to serve a growing mass market, was associated with Camden Goods Depot for about 100 years, and became the major employer in the area as well as the largest drinks firm in the world. Its premises in Camden covered a floor area of 20 acres (8 hectares) with the bottle and bonded warehouses capable of storing 800,000 gallons. Daily a whole train, the Gilbeys Special, left for the docks to supply distant markets around the world. 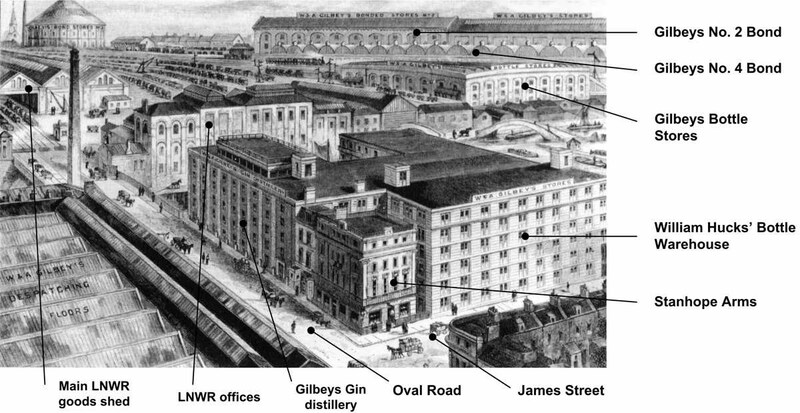 Gilbeys established their head office at the Pantheon in Oxford Street (the site of the present Marks & Spencer) in 1867 and shortly after was persuaded by LNWR to move their warehouse to Camden. Their first lease dates from 24 September 1869 and was for 21 years. The first buildings they occupied were the “A” Shed (the building formerly rented by Pickford & Co., south of the canal) and the Roundhouse, which became a bonded store. They also took over much of the extensive vaulting under the old Goods Depot, primarily that under the former Construction Shop, which provided an excellent environment for storage of wine. Many thousands of pounds had to be spent on converting the “A” shed and Roundhouse into valuable warehouses. 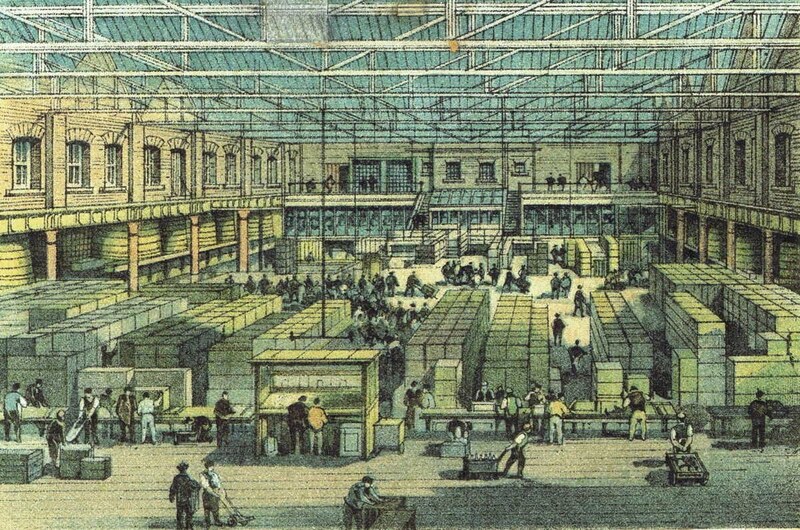 After the 1857 fire, Pickfords' warehouse had been rebuilt by LNWR but without stabling. The western side was rented by Chaplin & Horne and the eastern side by Pickford & Co. A second very damaging fire occurred on 26 November 1867 that removed much of the roof with its glass louvres. This fire may well have precipitated the departure of Pickfords. When in 1869 Gilbeys were invited by the General Goods Manager of LNWR to take it over, the warehouse was an open shed and being used, apparently not very successfully, as a potato market. By the late 1860s the Roundhouse had become a corn and potato store. When Gilbeys took it over in 1869, the railway tracks within the building were removed and a substantial wooden gallery built to carry vats of maturing whisky and brandy. A loading bay and two double doors were built on the Chalk Farm façade. The building continued as a secure bonded warehouse for nearly a hundred years, until Gilbeys gave up its use in 1963. 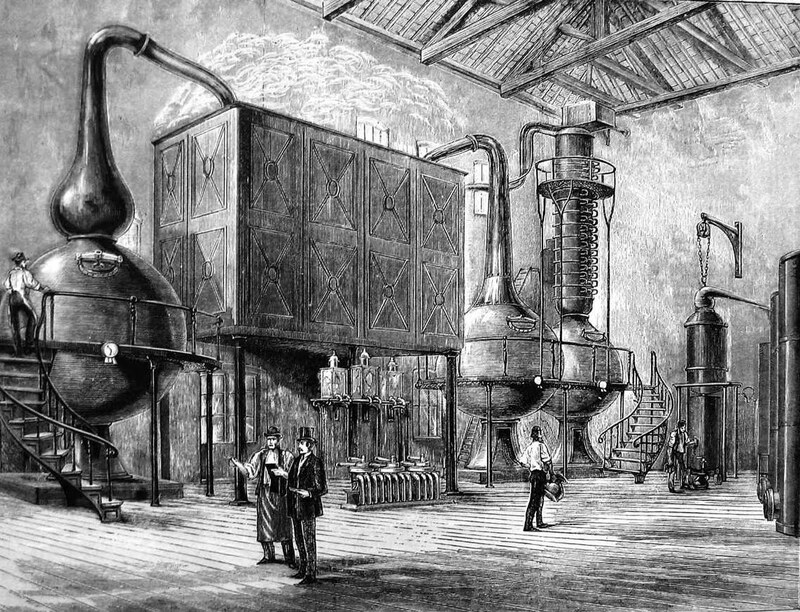 Gilbeys established a gin distillery in 1871 on LNWR land opposite the “A” Shed in Oval Road on the site formerly occupied by Camden Flour Mills. 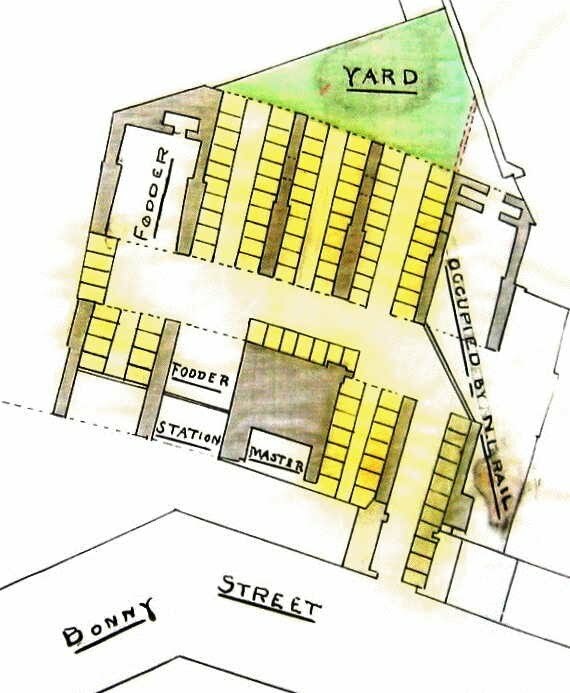 In 1894, Gilbeys bought the freehold from LNWR for £6,300, and in 1895 constructed three tunnels under Oval Road to connect the distillery to the basement of “A” Shed. The distillery site is now incorporated into what is known as Gilbey House in Jamestown Road, formerly the Bottle Warehouse built by William Hucks in 1896. The premises occupied by Gilbeys in the mid 1890s are shown in the engraving taken from the Gilbey Book of Wines of 1896. Artistic licence has been used to dramatic effect in magnifying Gilbeys' facilities, which are seen from the north. Gilbey’s “A” Shed in Oval Road, used for vatting, blending, bottling and packing of wines and spirits, demolished in the late 1960s. The site was redeveloped in 1977 and again in 2005-8 as the present so-named Lock House. Gilbey’s gin distillery opposite, close to Southampton Bridge. Gilbey House, now on the site, refronted in 1970, incorporates the distillery site. The triangular Bottle Stores, built in 1876 in Commercial Place (now Camden Lock Place). It had four characteristically shallow storeys, with large floor space for ‘bottle washing’ on the 1st floor, ‘bottles in crates’ on the 2nd, ‘packing case makers’ on the 3rd, and ‘bottles and packing cases’ on the 4th. It used timber floors on heavy cast-iron beams on cast-iron columns, later supplemented with steel frames for increased loading as a bottling works. It became a furniture store after Gilbeys vacated it, and was destroyed by fire in 1980. The site is now occupied by the Gilgamesh building. Gilbey’s No. 2 Bond in the left foreground, a narrow four storey warehouse sandwiched between the elevated 1846-7 vaults and the c1856 coal drop viaduct, also shown in the right background below. It was built in the mid 1880s in the former stables yard, and its construction was the same as the Bottle Stores. The building was mostly demolished in 1985, apart from a short section at the east end renamed commercially as the “Gin House”. The Roundhouse which became Gilbey's No. 3 Bond. In front of No. 2 Bond in the picture above can be seen a row of roofs that form the single storey structure of Gilbey's No. 4 Bond, between No. 2 Bond and the NLR. It was erected in 1888 on top of the 1847 vaults and roofed with corrugated iron, which was replaced with a flat roof in the mid 20th century. It also incorporated a small railway shed that may have been a vestige of the 1847 Construction Shop, and was demolished c1985. 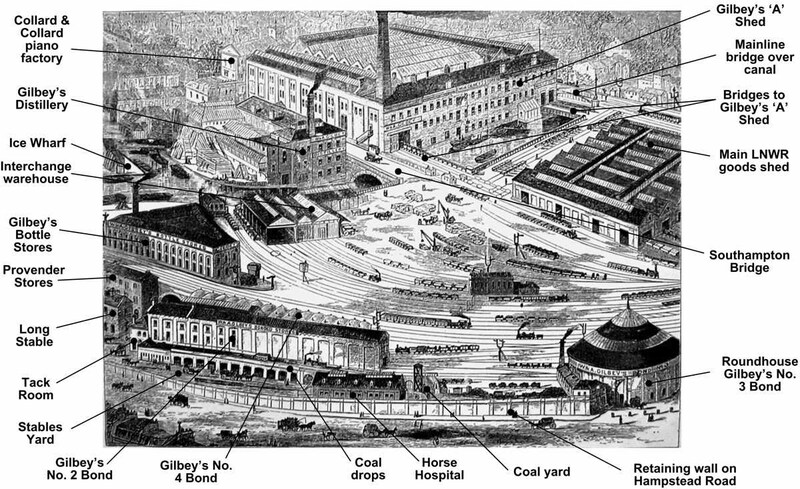 The other major Gilbeys facility, shown on the second picture, was W&A Gilbey's Stores built in 1896 by William Hucks. It had six and seven characteristically shallow storeys, with walls of mass concrete and a steel internal frame. It was converted to blocks of flats with a central lightwell in 1995-6 and is part of Gilbey House. The four storey Stanhope Arms public house on the corner of Oval Road and Jamestown Road, opposite the “A” Shed (second picture). It was purchased by Gilbeys in the 1890s with a view to development of the future site as a whole. 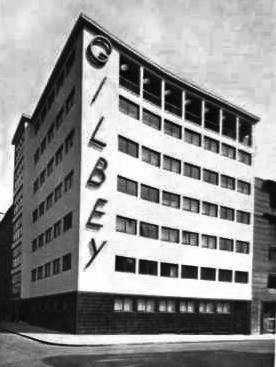 In 1937 it was rebuilt as Gilbey House (see picture) to become Gilbeys head office after they finally moved from the Pantheon. The seven storey building, now renamed Academic House, was designed by Serge Chermayeff, a respected architect of the International Modern School. The Interchange Warehouse (refer first picture), a two span single storey goods shed built in 1856 over the canal dock, extended to the east by a further span in 1896. In 1905, after the construction of the present Interchange Warehouse, Gilbeys rented the basement warehouse on the east side of the basin, an area of 1467 square yards. In 1911, Gilbeys took over part of the vaults underlying the forecourt of the warehouse, previously occupied by S. Allsopp & Co., at a rent of £350 per annum. This became their No. 1 Bond and connected directly with the Eastern Horse Tunnel and thus to the No. 4 and No. 2 Bonds. A piano factory belonging to Collard & Collard (refer first picture), the tall building beyond the “A” Shed, which predated the Rotunda factory that was established in 1851 on the opposite side of Oval Road. The Rotunda is not visible behind the houses in Jamestown Road. The Ice Wharf in Jamestown Road, which had two ice wells at the canal edge, one still in existence, with a timber yard next to it (first picture). Four of the five stable blocks, including the western ends of Long Stable and Provender Stores, the northern end of Tack Room, and the first phase of the Horse Hospital. It is not known which of the railway stables were used by Gilbeys. The Coal Drops (first picture) in front of No. 2 Bond and the small Coal Offices building at the eastern end of the coal drops. The LNWR offices were in a building on the north bank of the Canal between the Interchange Warehouse and Southampton Bridge (second picture), and have been omitted by the artist in the first picture to avoid obscuring Gilbeys' facilities. Gilbey’s No. 5 Bond was at Camden Town Station under the large arches formed by the viaduct of the North London Railway. Part of this was converted into stables for about 100 horses by the NLR for Gilbeys under a licence dated 14 October 1893 granted by the freeholder, the Marquis of Camden. From about the 1920s Gilbeys only used horses for ceremonial and advertising purposes. The four-in-hand coach and the coach horses were stabled in the lower floor of the Horse Hospital and Sir Walter Gilbey continued to use them to commute to Gilbey House up to the 1960s. The “North London Press” of 22 September 1967 reported the stables would close at the end of that month, the four coach horses to be put out to grass, and the ceremonial coach to go to the Gilbey family home at Rosehill, Berkshire.